Respondents of a Business Times (BT) opinion poll viewed positively and with optimism the long-awaited findings of the Treasury Bond Commission but were unsure as to whether the Government would actually penalise, as promised, the named offenders. The Commission in its report, sections of which were revealed by President Maithripala Sirisena in a nationwide television broadcast on Wednesday evening, passed several strictures on former Central Bank (CB) Governor Arjuna Mahendran, his son-in-law Arjun Aloysius and Perpetual Treasuries Ltd (PTL) CEO Kasun Pallisena and recommended stringent action. Meanwhile Mr. Mahendran who is a Singapore national and has no dual citizenship is abroad. While former Finance Minister Ravi Karunanayake was not directly implicated in the bond scam which the Commission said resulted in a loss running into millions of rupees to the State, the report recommended action under the Bribery Commission Act over Mr. Karunanayake’s apartment lease that was paid by Mr. Aloysius, a suspect in the bond scam. 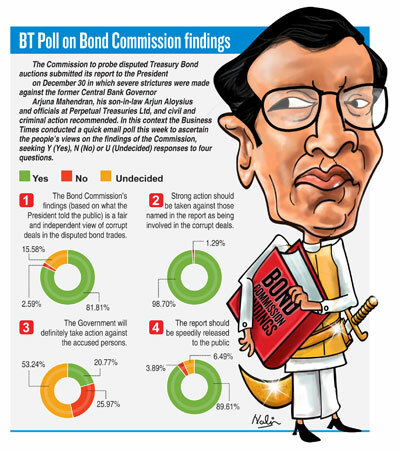 In a quick BT survey through email conducted soon after the President revealed the findings of the Commission on Wednesday night, 82 per cent of the respondents said “Yes” to the question: (1) The Bond Commission’s findings is a fair and independent view of corrupt deals in the disputed bond trades. However asked whether “the Government will definitely take action against the accused persons”, 53 per cent responded with “Undecided,” 26 per cent said “No” and 21 per cent said “Yes”. Some respondents who did their own polls on a twitter account found the same result; that people are not convinced that the government would take action. A resounding 99 per cent said “Yes” when asked whether strong action should be taken against those named in the report as being involved in the corrupt deals, while 90 per cent agreed that the report should be speedily released to the public. The survey, conducted over just 10 hours, attracted a wide response from a cross-section of people including company directors, public officials, social activists and students. It reflected the public’s anxiety to ascertain the findings of the Commission whose widely-publicised proceedings itself attracted a lot of attention amongst scandalous profit-making by PTL. However many respondents who made additional comments also noted that the Government, with the same haste, should probe bond issues during the former regime and similarly take action, a process that has disappointed many supporters of this government. “The politician mentioned (in the report) will be let off. So will the head of the bank. The rest of the guys named will be punished then bailed out,” said another disappointed respondent adding a sad-face ‘emoji’ to his comment. · The Commission seems to be too lenient in its statements on the PM’s role. · Definitely action needs to be taken against the bigger players rather than the lower level miscreants, and this should be within a definite timeframe, otherwise there will be public disappointment. · There could be some legal hurdles. Can a court of law pass judgment on the basis of the findings of a Commission? Unlikely. So the AG’s Department will have to prove fresh cases against each of the accused. The government may go through the motions for appearances sake, but the chances of all parties being adequately punished are slim. · So far they (government) only talks with no action. Whether the same practice will happen here remains to be seen. · Given the poor track record of this Government in its action against the so-called “crooks” of the last regime, “taking action” is a debatable point. · The President has made definitive comments on taking action and has to maintain credibility. Interim panel to manage SriLankan Airlines?